The feature race on Saturday is Ascot’s Victoria Cup, a competitive early season handicap over seven furlongs. The early market leader for the race is Newbury Spring Cup winner Haaf A Sixpence who beat a top quality field after racing prominently on the heels of the leaders throughout. His style of racing suggests that the drop back to seven furlongs won’t inconvenience him and he has a good chance of defying a 5lb penalty. He had previously finished second in an equally difficult race at Doncaster and has been put up at 10-1 with Bet365. 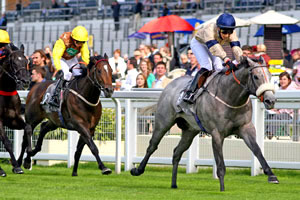 Another leading contender is Haydock winner Tartiflette who had Cape Classic and Highland Colori behind her that day. A 6lb hike in the weights does not look sufficient to prevent the improving filly from putting in another bold show here. Cape Classic and Highland Colori both appeared to have every chance in the Haydock race and will need to improve if they are to reverse the placings. First season trainer Charlie Hills saddles Glen Moss who ran on well to take second at Kempton last time out. Form on the all-weather surface does not always transfer to the turf but he looks to be going the right way and could be one to follow this season. A frequent visitor to Ascot for these seven furlong handicaps is Kevin Ryan’s Lightning Cloud. The consistent grey gelding is a course and distance winner and runs well for the trainer’s daughter Amy Ryan. He caught the eye when making his seasonal debut at Thirsk, making up ground fast and late to finish a close third. That run will have sharpened him up perfectly for this valuable prize and he looks worth a bet at odds of around 14-1. He ran well last year to finish fifth and connections have made this race his early season target. There are plenty of other horses with chances including Jamesie, beaten only a head last time at Dundalk, and Dream Tune who led the field until the final furlong at Newbury. Both were having their first runs of the season and can be expected to improve. Dream Tune will appreciate the drop back in trip and it would be no surprise to see him setting the pace again on Saturday. Jockey Ryan Tate takes off a useful 5lb and he has drawn stall 2, giving him a rail to run up against. It is difficult to say if there is any specific draw advantage here but the race could split into two groups with the majority of the fancied horses drawn high.